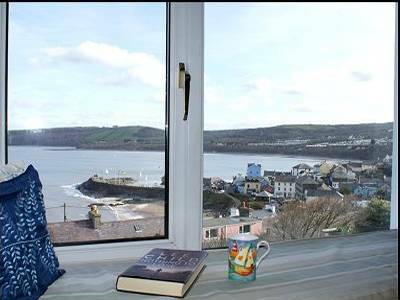 The Lookout, New Quay - sleeps 2 with fabulous views. 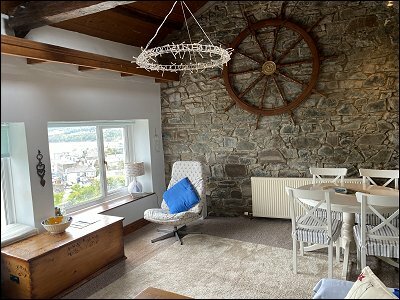 The Lookout is a double glazed and centrally heated first floor one bedroom holiday rental at the end of Lewis Terrace, right on the Ceredigion and All Wales Coastal Path – from the house you can join the path and walk for miles in either direction. 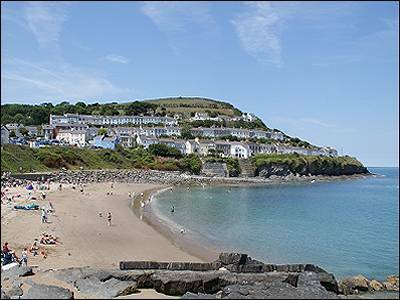 With a stunning view of New Quay and Cardigan Bay from the wide front windows this is a perfect location for a couple. 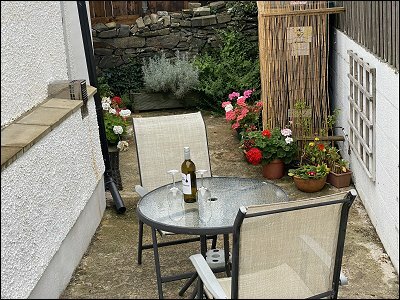 Although on the first floor, there are no stairs within the house, just a few steps up from the car parking area which is at the side of the property. 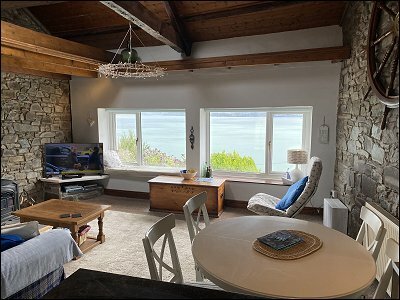 ACCOMMODATION - Open plan sitting / dining room with two sofas - a 3 seater and a 2 seater, 32" flat screen TV and DVD player. There is also a wood burning stove. 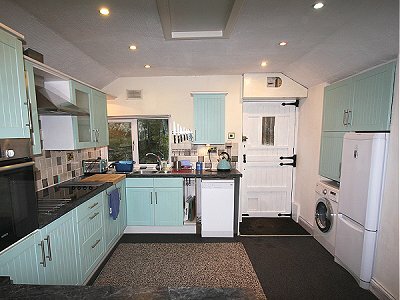 The spacious newly fitted well equipped kitchen has an electric oven and ceramic induction hob, large fridge / freezer, washing machine, dishwasher, microwave, as well as all the usual small appliances, crockery, cutlery, glasses and cookware. The dining table seats 4. 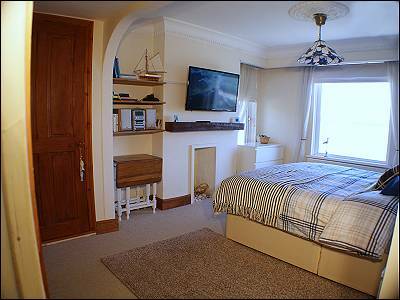 There is one double bedroom with a king size bed, a wall mounted 40 inch LCD HD TV. 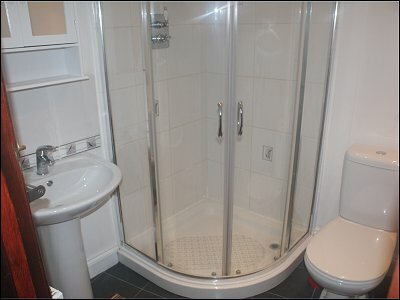 and an en-suite shower room with shower, WC and washbasin. Bed linen is provided but not towels. There is a second shower room with shower, WC and washbasin. Regret no pets. 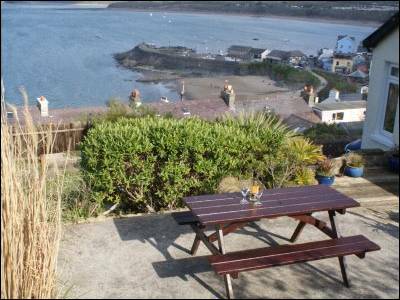 There is a rear patio area with table, chairs and parasol, and an elevated patio with picnic bench, and excellent views across New Quay and Cardigan Bay. Private off road parking for one car only. Electricity and heating is inclusive - the property has oil central heating. Bed linen is provided, but not towels or beach towels. There is private off road private parking for one car. Access: There are 4 steps up from the parking area and another 5 down from the top patio to the lower patio and door. The Lookout is a real home from home. It has the best views ever including the Dolphins!! We've properly relaxed for about the first time in a year - thank you. 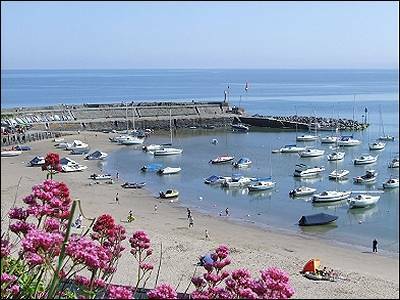 The walks, views, food, beaches are all wonderful - don't tell the rest of the world. Jacky and Nigel, Middlesborough. A view like this deserves the best and the Lookout delivers. Lovely relaxing and peaceful stay. Best flat we've stayed in and sad to leave it and the view. Enid and Nigel, Dorset. Wonderful few days. Just what we needed. Around 4 Dolphins watched from the lounge window for a good hour. Thanks. See you again soon. Helen and Martin, Merthyr. Had a fantastic few days. Views from the flat are amazing and the flat was wonderful. Kate and Clare, Brecon. 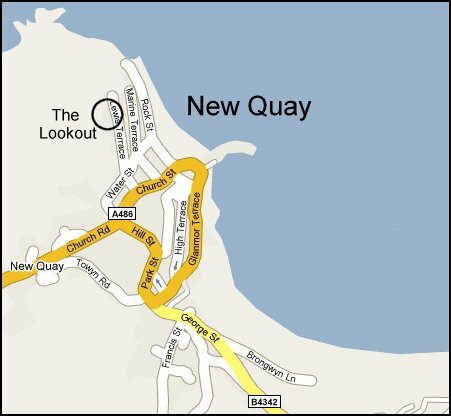 Best position in New Quay and our first look at Dolphins. Lovely week, lovely clean town, great flat. Hope to be back next year. Steve and Brenda, Solihull. We are going home to book again. We love it here after celebrating our 50th wedding anniversary. Thanks for the experience. Thanks for your help and thanks to Alwyn our neighbour, we have come to know in the week that we stayed here. Paul and Jenny, Ashby de la Zouch.